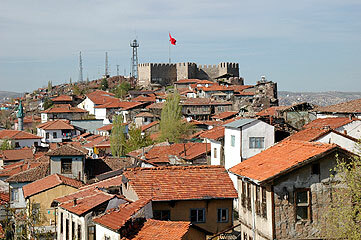 Although it is considered a new city, Ankara has very old origins. Located in an arid steppe region, in the heart of the Anatolian plateau, Ankara went through centuries of conquests. The Hattis and the Hittites settled in the region. Then in the 8C BC , the Phrygians built a city which was conquested by the Persians and later by Alexander the Great in 334 BC. 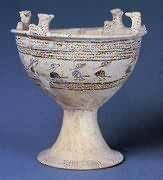 The Galatians, who were part of the great Celtic migration which invaded Macedonia and Greece, crossed over from Thrace to Asia Minor in 278-277 BC. 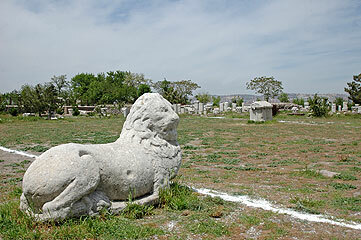 They settled in this part of Central Anatolia which they called Galatia. These seafaring people gave the city the name "Ankyra" which means "anchor", making it their capital and they built a citadel. In 25 BC, Galatia was incorporated by Augustus in the Roman Empire. The Romans adorned the city with monuments. Probably very soon after his second visit to Galatia, St Paul, inspired by the local population who was strong worshipers of pagan idols, wrote the famous "Epistle to the Galatians". In the 4C Ankyra became Byzantine, but between the end of the 6C and the beginning of the 9C, the prosperity of the city declined after the raids of the Persian Sassanids and the Arabs who destroyed it. In 1071, after the Battle of Manzikert, the city was taken from the Byzantines by the Seljuks who were conquesting Anatolia. This is when the name Ankyra was transformed into "Engüriye" or "Angora". After 1243, Angora, fallen to the Mongols, came under the sovereignty of the Ilkanids until 1304. The Ahi Dervishes of Kırşehir, with the help of the Germiyanoğulları Turks, ruled the city which was finally included in the Ottoman territories in 1354 by Süleyman Pasha, the son of Orhan Gazi. In 1402, as a result of the battle which took place in the plain west of the city between Yildirim Beyazit and Tamerlane, Angora was briefly in the hands of the Mongols. In 1414, however, it came back under the rule of the Ottomans. 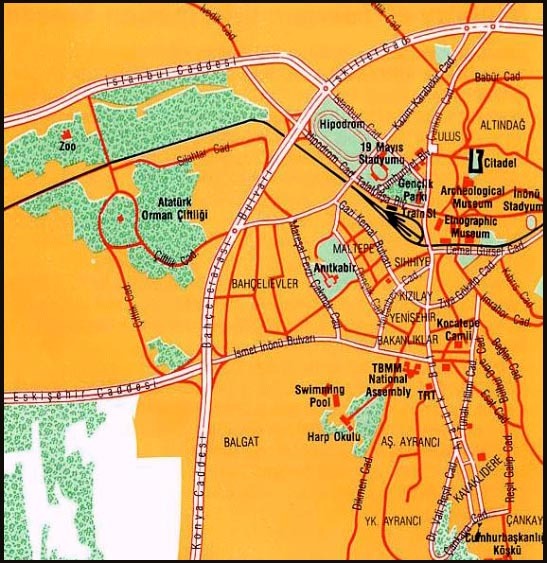 The city, which was an old caravan centre on the road to Persia, declined little by little until 1920 when Mustafa Kemal, later known as Atatürk (the father of the Turks), chose Ankara as centre of national resistance to the slicing up of the territory. For strategic, political and sentimental reasons, Mustafa Kemal had the capital transfered from Istanbul to Ankara on October 13, 1923. Triumphing over numerous difficulties, Ankara became the new Turkish Republic's symbol of will for recovery and showed a rapid social, economical, political, military and cultural development. In 1930, old Angora was officially given the name Ankara. Atatürk dedicated April 23 to the children of the country. Since then, every year, the Turkish children celebrate "National Sovereignty and Children's Day". On this day, festivities and ceremonies are held all over Turkey, but especially in Ankara at the 19th May Stadium. The children also replace the parliamentarians in the Grand National Assembly and hold a special session. UNICEF has recognized this important day as the International Children's Day. Children from different countries are housed in Turkish homes and during the festivities they represent their countries by singing songs and performing dances. 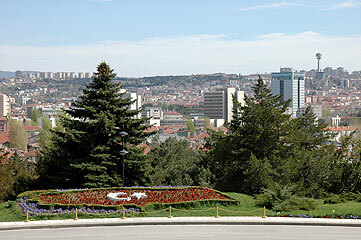 Today, the capital city Ankara is a spacious city with lots of green areas. Its numerous universities, research institute, academies, cultural centres, theatres etc, make it a place turned towards the future. 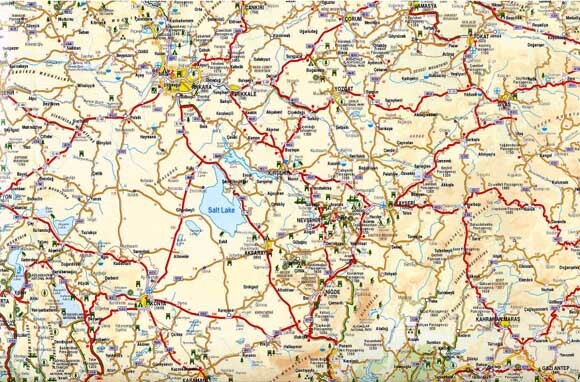 Ankara is not only a city of bureaucrats, civil servants and students, but also an important industrial, commercial and tourism center. The Ankara Film Festival takes place every year in March, the International Children's Day on April 23rd, the International Asia-Europe Biennal in May- June, and the Ankara International Art Festival in April-May. The Anıtkabir is the Mausoleum of Mustafa Kemal Atatürk, the leader of the Turkish War of Independence and founder of the Turkish Republic. 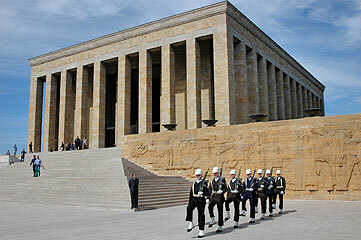 The construction of the mausoleum was started in 1944, six years after Atatürk's death. It was completed in nine years time. His mortal remains were transfered there on November 10, 1953 from the temporary burial site at the Ethnographic Museum. 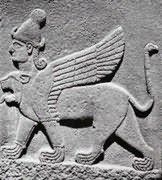 The triumphal alley, decorated with neo-Hittite style lions made of granite, opens on the esplanade and the Mausoleum which is a neo-classical temple with a 33 step stairway. The inside is decorated with colorful marble slabs and the ceiling is covered with golden mosaics. The symbolic sarcophagus is a 40 tons monolith marble (the actual grave is downstairs). The sarcophagus of Ismet Inönü, a major figure in the Republic's history as he was twice elected Prime Minister during Atatürk’s presidency and became second President of the Republic, stands at the other end of the huge courtyard, facing the Mausoleum. Inönü, who was also a close friend of Atatürk, died on December 25, 1973. 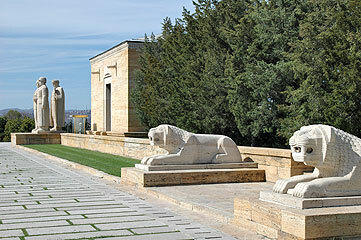 The Atatürk and War of Independence Museum is situated beneath the Hall of Honor in the Mausoleum. Here are exhibited Atatürk's personal belongings and gifts made by foreign statesmen, panoramas with a three dimensional effect and large paintings depicting the Gallipoli Campain and the War of Independance. Explanations and numerous documents give us information about the reforms, the development of Turkey and the institutions that played an important role under Atatürk. In accordance with Atatürk's famous words saying “Peace at home, peace in the world”, the park inside which the Anıtkabir has been erected has been named the Peace Park (Barış Parkı). Over a hundred species of trees and plants from all over the world and from several regions of Turkey embellish the park. There are two groups of statues at the beginning of the triumphal alley:on the right stands the group of women; one is carrying a wreath symbol of a productive country. Another one is imploring God’s mercy, and the one in the middle is crying. The group of men depicts the Turkish soldier, the intellectual Turkish youth and the Turkish farmer. The Museum of Anatolian Civilizations (Anadolu Medeniyetleri Müzesi) displays rich and unique collections including prehistoric, Hatti, Hittite, Assyrian, Phrygian, Urartian, Persian and later period collections. In 1968, the museum was installed inside two 15th century restored Ottoman buildings, the Mahmut Paşa Bedesteni (covered bazaar) and Kurşunlu Han. The museum is located at the foot of the citadel in the old town and can be reached from Ulus Square, one of the busiest area in the city which is easily identifiable by the equestrian statue of Atatürk. 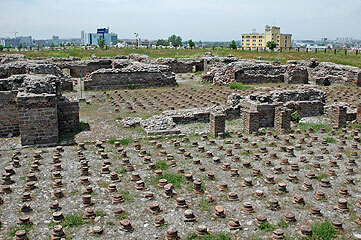 The Ankara Citadel (Hisar) was probably built by the Romans over the foundations of the Galatian citadel. It was repaired and strenghtened by the Byzantines, enlarged by the Selcuks and finally restored by the Ottomans. The citadel is composed of the outer remparts andthe inner remparts. The outer wall, which encloses the old city of Ankara, is approximately 1,500 m/ 0,93 miles long with 12 square towers and two semicylindrical towers (originally 14 and 3) which protected the main gates. The inner castle is made partly re-used building materials. Within the maze of narrow streets and at the foot of the citadel there are many Ottoman-style houses dating as far back as the 17th century. One of them has become the Old Turkish House Museum. 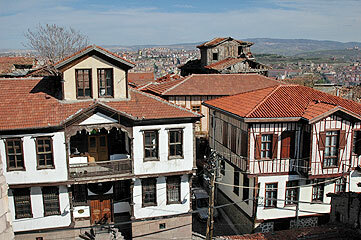 Other houses have been transformed into charm hotels, restaurants and cafés with panoramic views over the city. Within the walls of the citadel is Alaaddin Camii. An inscription on its carved mimber reveals that the mosque was built in 1178 by the Seljuk ruler, Mesut. Arslanhane Camii was constructed in 1290 during the Ahi Dervishes period near the citadel. It is a beautiful example of late Seljuk art with a double line of wooden columns topped with Roman or Byzantine capitals, a walnut carved mimber (pulpit) and a beautiful tiled mihrab (prayer niche) indicating the direction of Mecca. Next to the mosque is the türbe (tomb) of Ahi Şerafettin, the founder of the mosque. The mosque was named “Aslanhane” which means the "Lion house" because of an antique architectural fragment depicting a lion incorporated into the wall of the tomb. Ahi Elvan Camii is located in the Ulus quarter near the citadel. This mosque was built between the late 14th and early 15th centuries and contains capitals from the Roman or Byzantine period. The finely carved mimber is of particular interest. 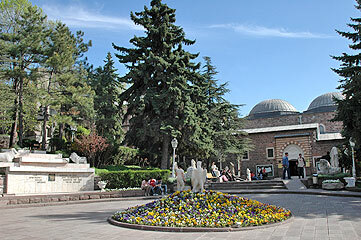 Yeni Camii, the largest Ottoman mosque in Ankara, is located on Ulucanlar avenue. The mosque and türbe were built in 1565 by the school of the famous architect Sinan for Cenabi Ahmet Pasha, the governor of Ankara. It is a good example of a single domed mosque of Ottoman architecture. Kocatepe Mosque, the largest mosque in Ankara, has a capacity of 20,000 people. Its was constructed between 1967-1987 in the Ottoman architectural style with four minarets. The Çengel Han Koç Museum: this caravansarai, built in 1522 under the reign of Sultan Selim I, played a primordial role in the city's cultural and commecial life until the late 19th century. During the first half of the 20th century, the han still had shops that sold a vast range of goods, but it progressively fell into disuse and ended up as a tannery, warehouse and store until it was abandoned in the 1990s. Beautifully restored by the Koç family, the Çengel Han has been reopened as a museum. 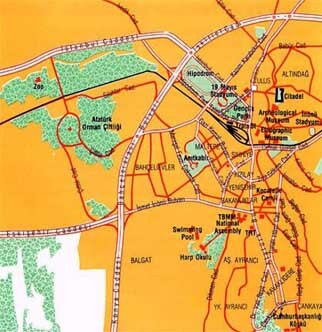 It is located opposite the main gate of the citadel. 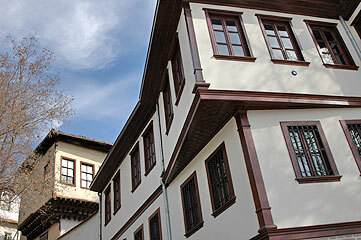 The Ethnographical Museum, located on Talat Paşa Boulevard in Ulus, was opened to the public in 1930. 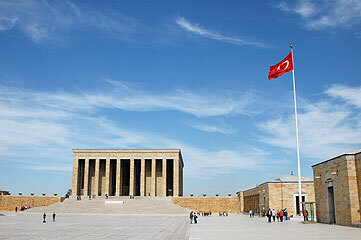 The courtyard was closed in November 1938 when it served as the temporary burial site for Atatürk, and reopened when his ashes were transferred to the Anıtkabir on november 1953. 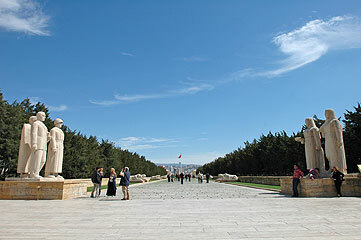 This section is still preserved as a tomb in symbolic respect of the memory of Atatürk. 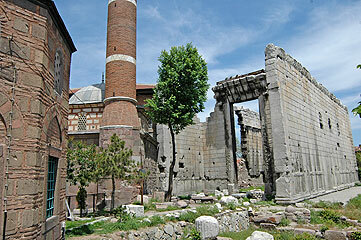 The museum displays examples of Turkish art from the Seljuk period until the present day and also houses a library. The State Museum of Painting and Sculpture was built in 1927 upon the directive of Atatürk. It displays works of Turkish artists. Temporary exhibits of both foreign and Turkish artists are sponsored. The museum is located close to the Ethnography Museum. The Republic Museum: this building, close to Ulus Square, was originally planned to house the People's Republic Party. It became the building of the National Assembly, replacing the first one which was too small to meet the needs of the developing Turkish Republic. The Museum of the War of Independence : this building, situated in Ulus Square, was the first home to the National Assembly from April 23 1920 to October 15 1924, when it was moved to the now Republic Museum. It was later the headquarters of the People's Republic Party, and then the Law School. In 1952 it was turned over to the Ministry of Education and on April 23 1961 it was opened to the public as the museum. The Ankara Atatürk Cultural Centre and Museum of the Revolution and the Republic: the walls of the ground floor are covered with reliefs depicting the War of Independence, the reforms, the Republic under Atatürk and his ideas concerning art, youth and independence. Explanations have been prepared in Turkish, English, German and French. In the basement, the War of Independence, reforms and development of Turkey and the institutions that played an important role are illustrated through words, pictures and models. There is also a 25-minute multimedia presentation documenting the Turkish journey from Central Asia to the founding of the republic and all of Atatürk's reforms. The Natural History Museum displays examples from the fields of paleontology and geography, including fossils, minerals and rocks. There is also the skeleton of the Maraş Elephant, the giant Ammonite that lived in the region 193 million years ago, and the fossilized footprints of humans who lived in Anatolia 25,000 years ago and were found in Manisa. The Railway Museum is part of the main railway station. In a small park at Hükümet Square stands the Column of Julian the Apostate. The column bears no inscriptions, however it is thought to have been erected in 362 to commemorate the visit of the Emperor Julian in Ankyra. Julian, the nephew of Constantine the Great, was raised a Christian but converted to mystical paganism and, in 361 ,proclaimed freedom of worship for pagans and Christians; he nevertheless promoted paganism over Christianity. The column, which is 14,50 m/ 47.5 ft high, is known locally as the Belkis Minaret or Minaret of the Queen of Sheba. 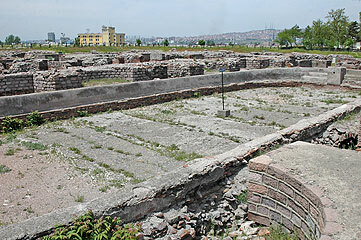 Adjacent to Haci Bayram Mosque stand the ruins of the Temple of Augustus. The temple was probably built between 25 and 20 BC after the annexation of Galatia to the Roman Empire by Augustus, on the site of a former sanctuary dedicated to the Phrygian Mother-Goddess Cybele and to the Phrygian Moon God Men. The temple seems to have served as a model for the Temple of Aizanoi. The naos, with Corinthian columns (4 in front and 2 in the back), measured 12,8 x 28,21 m/ 42 x 92.55 ft and stood on a 36 x 54,82 m/ 118 x 180 ft podium. About 150 AD, the temple was surrounded by a pseudodipteral Ionic peristyle with 15 columns along the length and 6 columns along the width. During Byzantine times, the temple was converted into a church and three windows and a crypt were added. 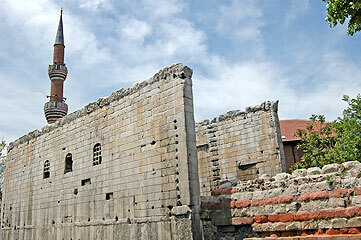 In 1427, a mosque was built in honor of Haci Bayram Veli at the northwest side of the edifice. His türbe (tomb) stands next to the mosque. A latin copy mentioning Emperor Augustus' last will and testament, the instructions for his funerals, a statement of the military and financial situation of the Empire and an exhaustive list of his acts was engraved on the walls of the temple (the original text is at Augustus Mausoleum in Rome). Only the list of the acts of Augustus or "Index rerum gestarum" has been preserved and can be seen on the inner walls of the pronaos, while the Greek version is engraved on the southwest outer wall of the naos. Another copy in latin, now in the Museum of Anatolian Civilizations, has been found in Antioch of Pisidia (Yalvaç), and a Greek copy in Apollonia of Phrigya (Uluborlu). The Roman Bath Complex, whose entrance is on Çankırı Avenue, was built by the Roman Emperor Caracalla (211-217), the son of Septimius Severus and was connected to the sacred precinct of the Temple of Augustus by a colonnaded way. The complex spread on a large area of 80m x 130 m / 262.5 ft x 426.5 ft. and was composed of a rectangular palaestra (a place for physical training and wrestling) surrounded by a portico with 32 columns on each side. It was linked on its western side to a pool. The bath consisted of four separate rooms, the frigidarium (cool room) behind the palestra and directly connected to the apodyterium (changing room) on the left. The large Tepidarium (warm room) and the Calidarium (or sudatorium, the hot room) were both raised on pillars made of round bricks for the hot air circulation. The Turkish Angora Cat (Ankara kedisi) is one of the oldest and longhaired pure breeds. It has blue and amber color almond shaped eyes. The Angora Goat, according to a first theory, is believed to originate from Central Asia, from where it would have been brought by the Oğuz Turks. 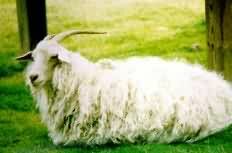 Another theory, supported by scientists, is that this goat originates from the very region of Ankara. Anyhow the climate of the Anatolian plateaus is essential for growing their beautiful fleece (mohair).